Anxiety disorders, which include posttraumatic stress disorder, social phobias and obsessive-compulsive disorder, affect 40 million American adults in a given year. Currently available treatments, such as antianxiety drugs, are not always effective and have unwanted side effects. To develop better treatments, a more specific understanding of the brain circuits that produce anxiety is necessary, says Kay Tye, an assistant professor of brain and cognitive sciences and member of MIT’s Picower Institute for Learning and Memory. The tips of long neuronal extensions from the amygdala (green) contact neurons of the hippocampus (blue). This communication pathway helps to modulate anxiety. via Brain circuit can tune anxiety – MIT News Office. 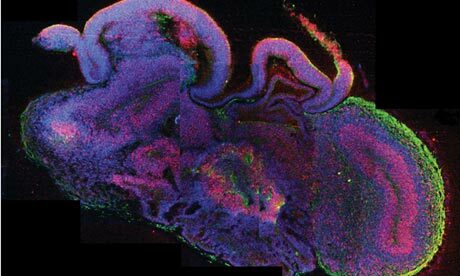 via Miniature brains grown in test tubes – a new path for neuroscience? | Science | The Guardian. Could the triple whammy technique that beat HIV/Aids win battle against cancer? Could the triple whammy technique that beat HIV/Aids win battle against cancer? | Science | The Observer. The incredible beauty in the life of cells – YouTube. ▶ Hepatitis A and B – YouTube. ▶ Antonio Damasio: The quest to understand consciousness – YouTube.